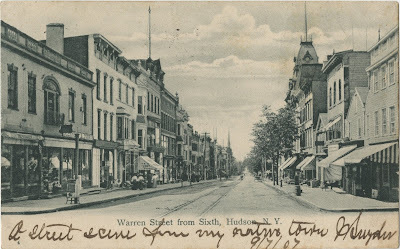 Most of us are familiar with a few postcard images of Hudson, and some of us may even have our own collections of postcards from a hundred or more years ago, but the History Room at the Hudson Area Library probably has one of the largest collections. 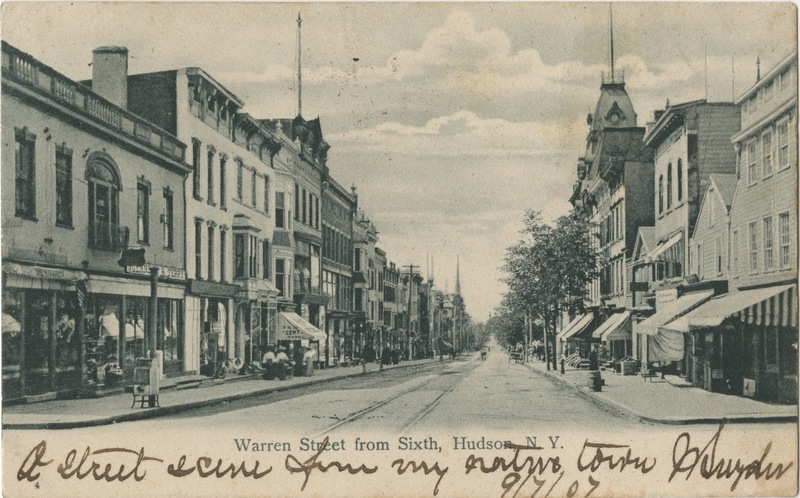 In September, the library will be putting some of its extensive collection on display in an exhibition called Wish You Were Here: A Look Back at Life in Hudson Through Vintage Postcards. The exhibition, which is the library's first ever local history exhibition, was curated by David Murphy, a past president of the library board and a current member of the History Room committee. 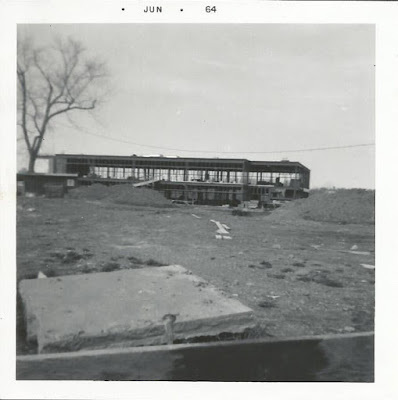 There will be an opening reception on Thursday, September 6, from 6 to 8 p.m., featuring a presentation by Gary Sheffer, a Hudson native who in March did a talk at the library about the General Worth Hotel. Wine and cheese will be served. The library will also have note cards and T-shirts for sale with an iconic Hudson postcard image. The exhibition and opening reception are in the Community Room of the Hudson Area Library, located at 51 North Fifth Street. Recently, I discovered two pictures taken in 1963 at the intersection of Second and Union streets in the collection of photographs by Howard Gibson. I was inspired to share them and to compare them with pictures taken this afternoon, from more or less the same vantage points. 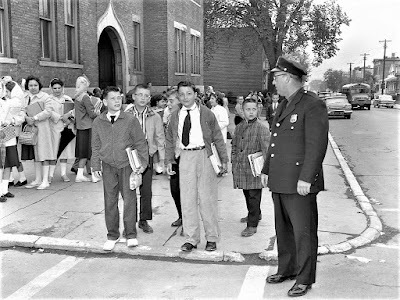 There have been some changes since 1963. The stucco was removed from the house on the northwest corner to expose its original clapboard, and the house was subsequently transformed into a faux Colonial Revival invention. 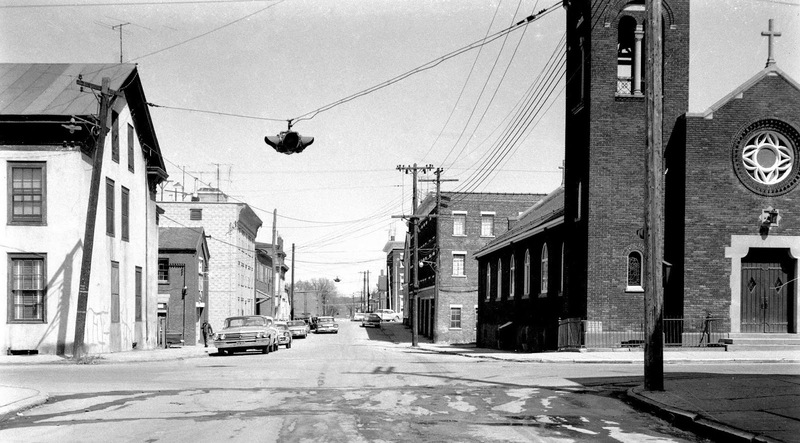 Although all the buildings on the four corners remain intact, four buildings included in the 1963 photographs have been lost: the Dutch house that once stood at 128 Union Street and the two infill houses on either side (shown in the photograph below), and an old carriage house that once stood at the southwest corner of Second Street and Cherry Alley, which can be seen clearly in the photo by Gibson above. 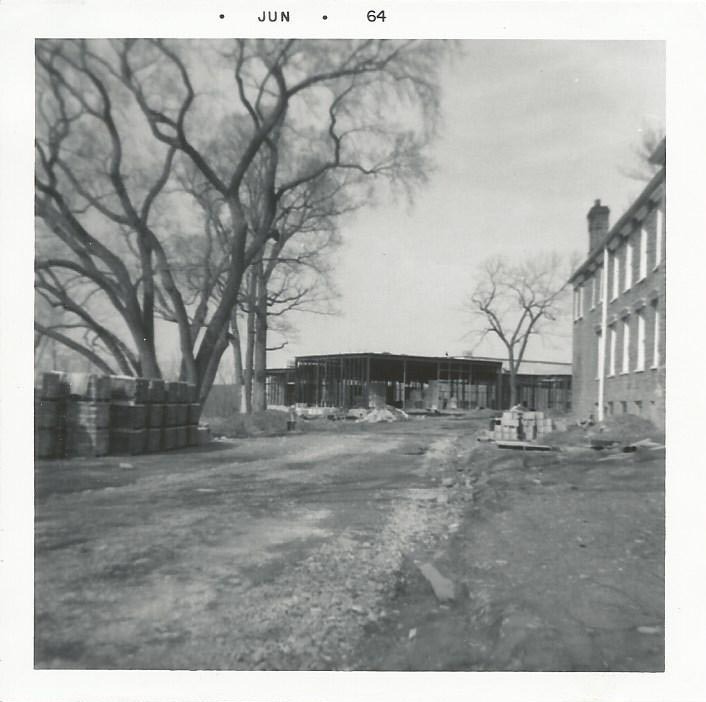 Aside from that, the most striking difference between 1963 and today is that there's a lot more greenery now than there was fifty-five years ago. 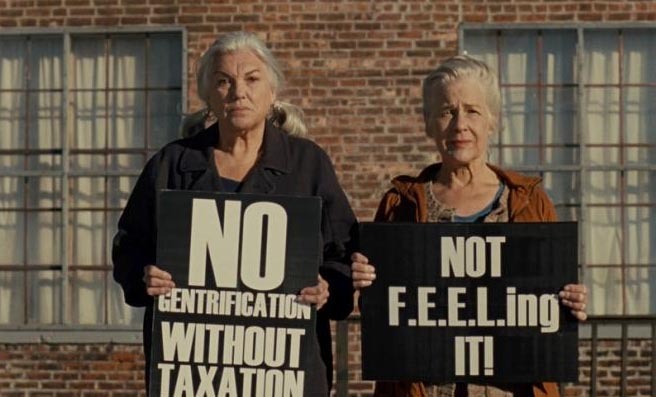 As the Hudson Development Corporation board reconstructs itself, one may well wonder about the redevelopment of the Kaz site, the project that inspired the crisis of confidence that led to the resignations that necessitated electing new board members. Slightly less than a half million dollars of DRI (Downtown Revitalization Initiative) funding has been earmarked for the redevelopment of the Kaz site, but the project has been stalled for the past three months. The Kaz redevelopment project was discussed at the HDC meeting earlier this week. At the beginning of the meeting, acting chair Bob Rasner noted that the next steps for Kaz "revolved around the question of CSX," explaining that "the project is not viable without the CSX property." The CSX property is needed to give the Kaz site access to South Front Street. Later in the meeting, when public comments were entertained, the project came up again. Audience member Charlie Suisman alluded to it when he said, "Hudson doesn't want decisions made for it." Clark Wieman maintained there was a "huge gap in what the community understands about Kaz." Don Moore, who is treasurer of the HDC board, responded by saying, "If there is any lack of clarity … we have a new board." He went on to counter the intimation that the Kaz project has been going on for two and a half years because of mistakes by saying, "I prefer to think of it as due diligence." Of the CSX property, Moore commented, "We know without that property it will be very difficult to go forward." The acquisition of the CSX property seems also to be on hold. The negotiations with CSX, which have been going on since December 2016 when Senator Chuck Schumer came to Hudson to pledge his support and assistance, finally reached the contract stage this past spring. 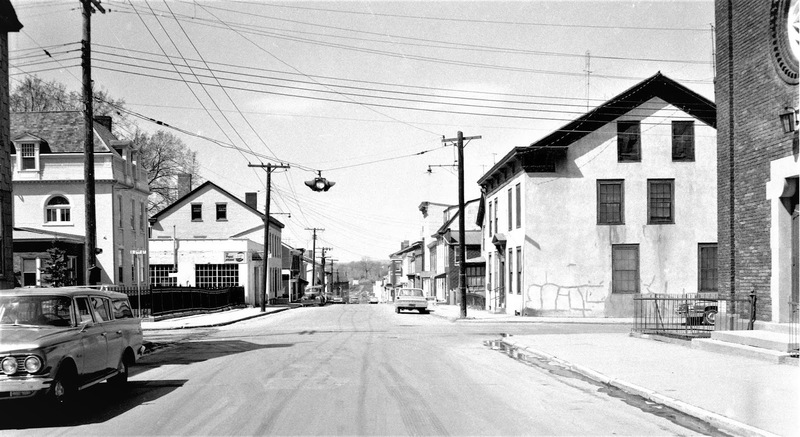 CSX would sell an L-shaped portion of its property on South Front Street, approximately half an acre, for $85,000. HDC had a $90,000 loan from CEDC (Columbia Economic Development Corporation) in place to pay for it. Because one of the people who had resigned in May was HDC's attorney Matt Griesemer, John Friedman was asked to review the contract. At the June meeting of HDC, Friedman advised against entering into the contract because, as it was written, it would indemnify CSX of any responsibility for contamination on the site, and he warned, "It seems certain that there is toxic 'stuff' there." Friedman recommended instead that the City take the property by eminent domain. If pursued, the eminent domain process will take some time, time that was seen as an opportunity to restart and rethink the project and to engage and educate the public. Newly elected HDC board member Steve Dunn declared, "The CSX issue opens up an opportunity . . . to open the process and to discuss what the options are." Julie Metz, vocal critic of HDC, said, "The stall is an opportunity to plan and make certain the area is integrated into the city." She went on to say, "HDC existing on its own is not a good thing. I am not comfortable with a board that is not elected." 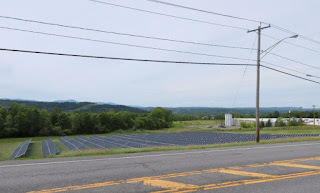 Last night, East Light Partners (ELP), the solar energy company proposing to erect solar arrays adjacent to Route 9 and the grounds of the Dr. Oliver Bronson House, made their second appearance before the Greenport Planning Board. As at the previous meeting, the members of the Planning Board expressed concern about the visual impacts of the proposed project, from Route 9, from the Dr. Oliver Bronson House and Olana, and from the National Register-listed, privately owned Henry A. and Evanlina Dubois House across Route 9 from the site. We were pleased that in order to avoid visual impacts to the Plumb Bronson House, ELP no longer proposes solar panels in the north field. 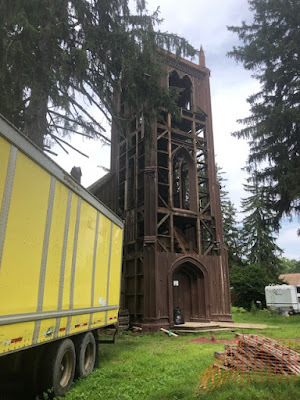 ELP also indicated to us that they would plant trees and additional screening of the remaining panels to prevent visibility from the Plumb Bronson House and grounds, as well as from Route 9. 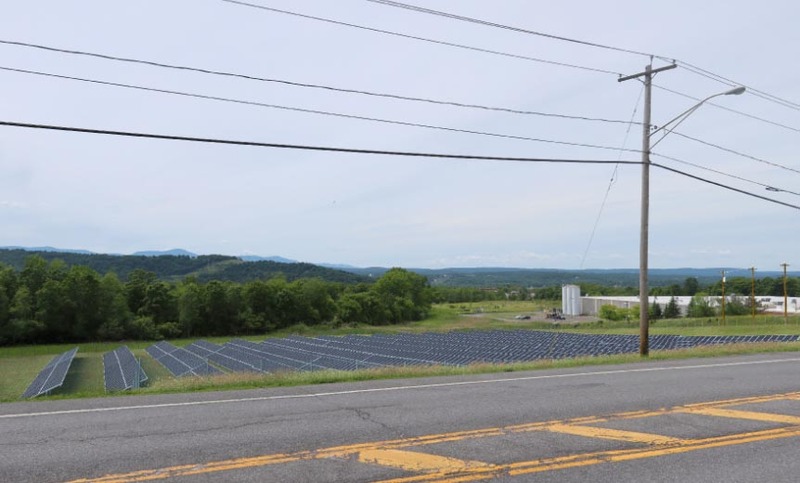 We reviewed the applicant's visual simulations of views from the Olana State Historic Site; based on those simulations, Scenic Hudson is not concerned that the solar facility will adversely impact views from Olana. The proposed facility is on former agricultural lands, part of which include soils of statewide significance. The applicant should be required to use construction methods and facility design that will not compact soils so that when the facility is no longer needed it can be decommissioned and the land again available for agriculture. We noted during our site visit the presence of extensive meadows of "pollinator-friendly" wildflowers. It is important that these wildflower meadows will persist between and around the rows of solar panels. . . .
Jamie and Wendy have been eager to work with us to ensure that the project's impacts can be avoided or mitigated. Scenic Hudson appreciates that they have amended the plan by removing from consideration panels in the north field. 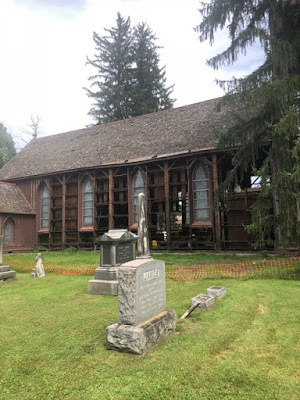 We hope the planning board and ELP will work together to ensure that additional trees and other vegetation will further buffer the remaining panels from view from both the Plumb Bronson House and landscape, as well as Route 9. Likewise, it will be important to ensure that when the facility is no longer needed, that the panels and other facilities can be decommissioned in such a way that the site can once again be farmed. . . .
Ed Stiffler, chair of the Greenport Planning Board, told Fordyce and De Wolf that "the letters don't really say they approve of what you're doing." He requested additional letters, specifically from Historic Hudson and Olana, "saying they have no concerns, or, if they do, what concerns they are." 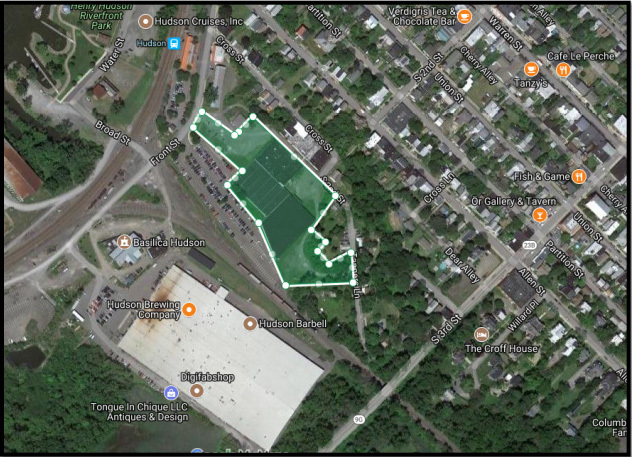 Ray Jurkowski, the consulting engineer for the Greenport Planning Board, urged Fordyce and De Wolf "to take a very close look at the landscaping plan." He suggested that six-foot spruce trees would not be tall enough to obstruct the view of the panels. Planning Board member Sandy Kipp wanted the site plan approval to specify that if a tree were to die, it must be replaced. She also reiterated Scenic Hudson's concern about the wildflowers and returning the site to farmland when the facility is decommissioned. East Light Partners is expected to be back before the Greenport Planning Board on Tuesday, September 25. 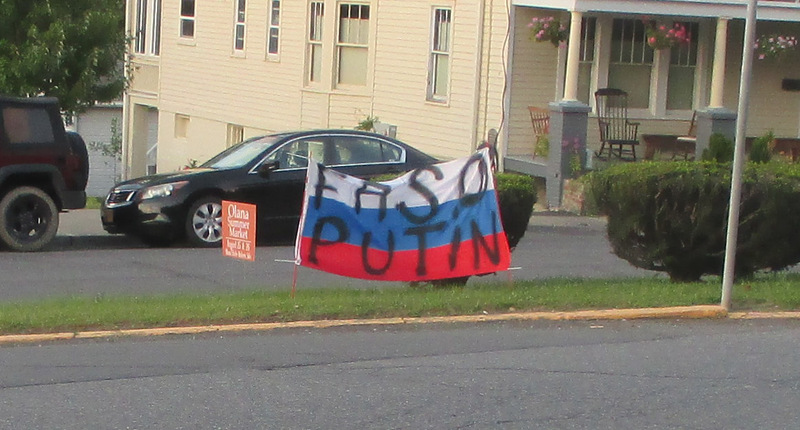 The regular meeting of the board begins at 7:30 p.m. in Greenport Town Hall. Eight of the nine members* of the Hudson Development Corporation Board of Directors met today at noon. Bob Rasner, vice chair of the board, who was presiding in the absence of the chair, John Gilstrap, opened the meeting by explaining to the twenty or so members of the public present that although open meetings law permitted the discussion of personnel and board appointments to be conducted in executive session, the board intended to carry out its interviews with the candidates who had been recommended by the nominating committee in an open session, unless a member of the board or a candidate felt uncomfortable with that process. The entire meeting was conducted in open session. Chris Jones, who was one of the three members of the nominating committee (the others were Rasner and Common Council president Tom DePietro), reported that the committee had received eleven applications and had interviewed ten applicants. She explained that the committee's recommendations were based on a desire "to fill the board with expertise we lack and to get some institutional memory about Hudson." Three of the four candidates recommended by the nominating committee were present, and after minimal discussion which involved having each candidate explain "how he felt his expertise would fit it," the eight members present elected all three candidates to the board. The new board members are: Walter Chatham, Steve Dunn, and Nick Haddad. Walter Chatham is an architect closely associated with the New Urbanism movement. He is currently co-chairman of the National Academy of Design and is on the board of the Architectural League of New York. He was appointed to the Hudson Planning Board by Mayor Tiffany Martin in the fall of 2017 and became its chair in January 2018. 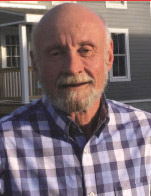 As chair of the Planning Board, Chatham is ex officio on the board of HCDPA (Hudson Community Development and Planning Agency), which he chairs, and on the Hudson IDA (Industrial Development Agency). Steve Dunn is a lawyer who also has an M.B.A. He was part of the Fair & Equal initiative last year, being principally responsible for doing the calculations to determine ward boundaries that would produce five wards of equal population while meeting all the other demographic standards for equity. He ran unsuccessfully to be the Democratic candidate for Common Council president last year, losing in the primary to Tom DePietro. 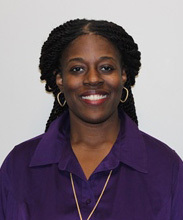 Dunn currently serves on the Zoning Board of Appeals. 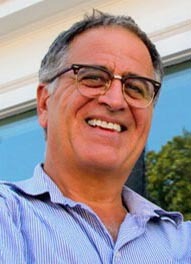 Nick Haddad has had a strong connection with Hudson for many years. He is the proprietor of Red Hook Electric and formerly also of Hudson Electric. He served on the Historic Preservation Commission, ran for mayor in 2011, losing to William Hallenbeck by only 53 votes, and served as First Ward alderman for two terms, from 2012 through 2015. Though all the candidates in their responses to the board spoke about city planning and urban design, Haddad was the only one to touch on what is the principal mission of HDC: job creation. He spoke of the city being "caught up in a renaissance" but noted that "a substantial part of the population is not working." He expressed the hope that the City and HDC can "take our benefits and make things happen that are equitable." * The nine members of the HDC Board are John Gilstrap (chair), Bob Rasner (vice chair), Don Moore (treasurer), Christine Jones (secretary), Rick Rector (mayor of Hudson), Tom DePietro (Common Council president), Carolyn Lawrence, Alex Petraglia, and Mark Morgan-Perez. 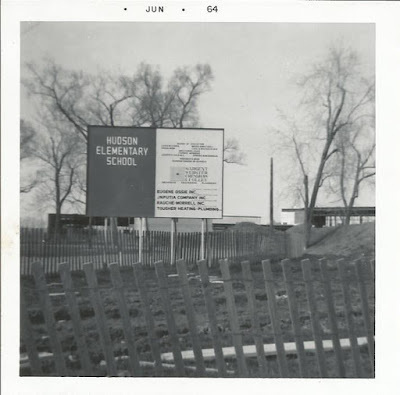 The pictures shared yesterday of John L. Edwards School, then known simply as Hudson Elementary School, under construction in 1964, raised a question about whether the new primary wing of the school recently renamed Montgomery C. Smith Elementary School will be ready to receive students when school opens next Wednesday. A drive by the school earlier today suggested that getting everything set for students and teachers by September 5--a week and a day from now--will be a challenge. Beginning at 7 a.m. tomorrow, Wednesday, August 29, the 300 block of Columbia Street will be closed so that a 30-foot section of collapsed sewer main can be repaired. Trucks will be detoured to State Street. Access to the county office building at 325 Columbia Street will be only from Third Street. 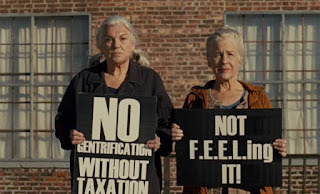 RG19 represents a community-driven response to the immediate challenges of a food and economically-insecure environment that currently exists in [Columbia County]. Inhabiting a renovated 16' trailer, the mobile store will offer a wide range of wholesome products, including fresh produce, dairy, bread, meat, seafood, canned and dry goods, toiletries and other miscellaneous products. Our intention is to provide convenient, quality food for all--no matter the income level--with a priority placed on low-income residents. 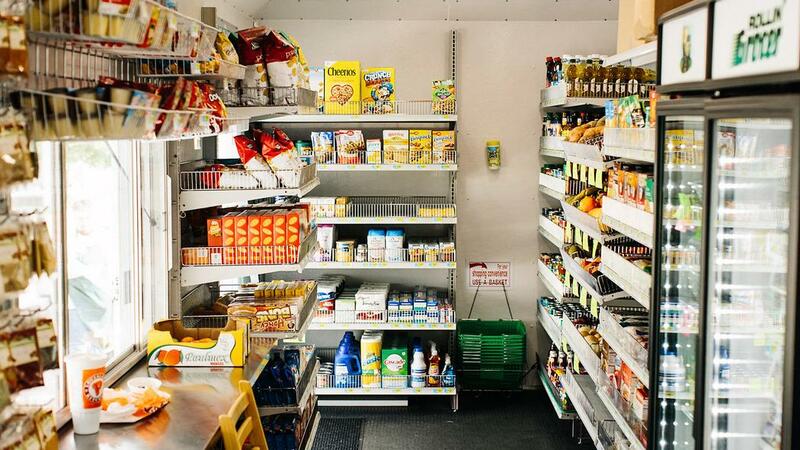 Food on the trailer will be made affordable through a fair pricing system (similar to sliding scale): customers will self-select into one of three price levels and pay for products according to their financial ability. At the same time, the mobile store will provide an additional wholesale market for producers, prioritizing sourcing from local environmentally-conscious farmers and distributors, and therefore supporting the direct reinvestment of local spending back into community businesses. For more information, visit rollinggrocer19.org. 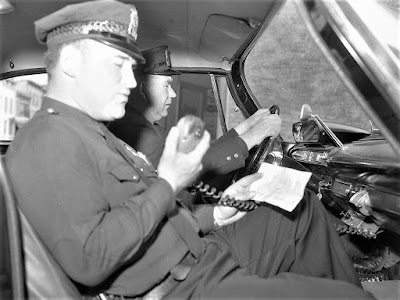 In 1960, photographer Howard Gibson, whose work has been archived by Bruce Bohnsack, did a series of photographs called "A Day in the Life--Hudson Police Dept." The following images are from that series. 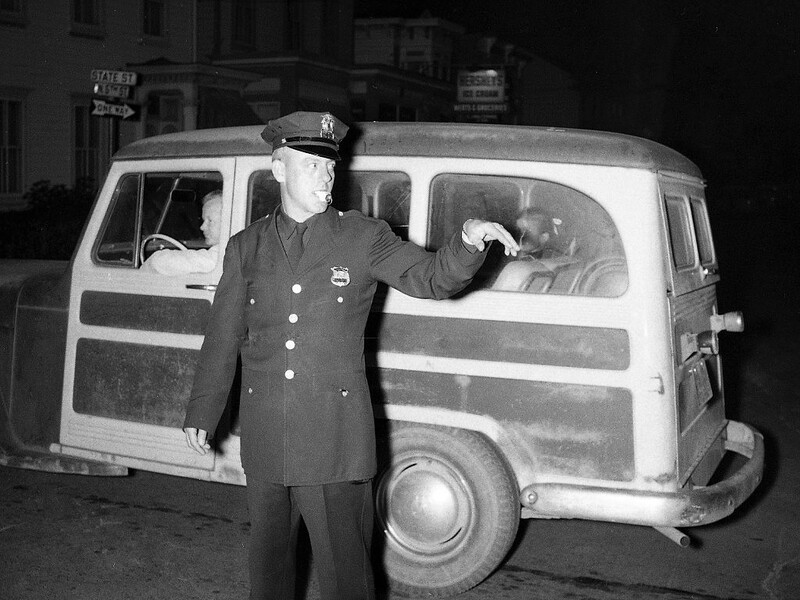 The ones I've omitted where taken at police headquarters, which in 1960 was located in the original City Hall at 327 Warren Street. Patrols responded to the area and located a male subject yelling at someone while standing in Rope Alley. Patrol spoke with the subject who told patrol that he was there getting items that belonged to him from the yard of 538 State Street and began arguing with the tenant, David W. Lindsey. The man stated that while he was retrieving his property . . . Lindsey came out and began to argue, saying that he was going to shoot him. Lindsey then allegedly went back into his residence, returned outside, and aimed a shotgun at the subject. The HPD got a search warrant, conducted a search of 538 State Street, and seized "a Remington Model 870 shotgun with a shortened barrel and approximately six pounds of marijuana." Patrol units on scene began to interview witnesses and determined there was a physical altercation within the Half Moon Bar between the victim and a man who fled the scene. . . . [A] search warrant was executed at 42 South Front St., Apt. 4, the suspect's residence. Julian Omar Smith, 35 yrs. old, of Hudson was located within his apartment and was detained. We are processing the evidence we have seized including some clothes and knives. We collected a whole smorgasbord of what we believe to be illegal drugs to include ecstasy, THC concentrated wax, mushrooms, marijuana, cocaine, LSD, and some pills we have yet to identify. The slashing assault was brutal and extremely violent. It was pretty bad. Forty-two hours in the life of the Hudson Police Department in 2018. Its days as a school building are over. When students in the Hudson City School District go back to class on Wednesday, September 5, no children will be going to John L. Edwards School. It's uncertain what future use building might have, but it's certain to be a topic for discussion and dissent. This afternoon, though, we can contemplate its beginning. Bruce Mitchinson sent me these pictures he'd taken of the building when it was under construction in 1964. It's going to be oppressively hot for the next few days, with the high expected to reach 95 degrees tomorrow and Wednesday. To help residents cope with the extreme heat, the City of Hudson has designated a cooling station at the Central Firehouse, 77 North Seventh Street. It is open today until 9 p.m. and will be open from noon until 9 p.m. for the next three days, through Thursday, August 30. 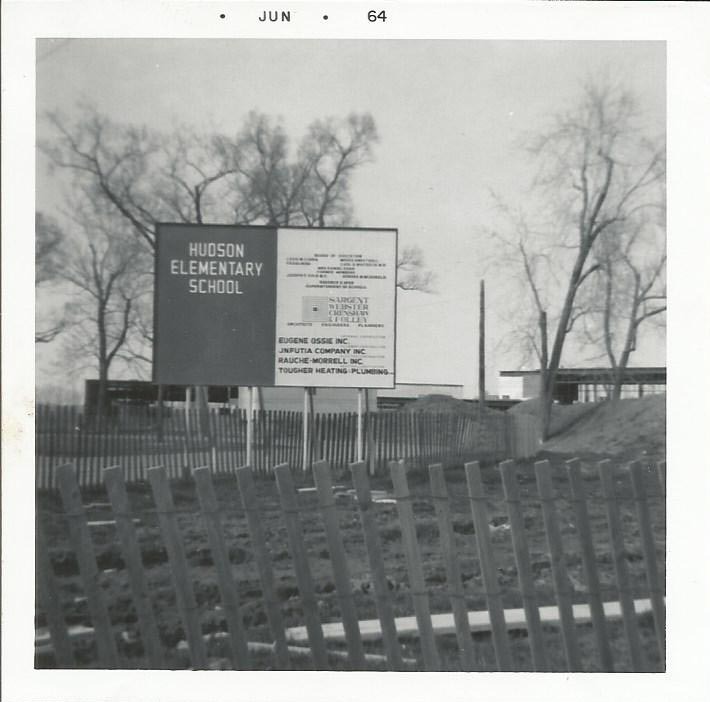 For more information, visit the City of Hudson website. All the meetings this week are happening in the first two days. After that, the approach to the long weekend and the holiday that marks the unofficial end of summer is meeting free. Today, Monday, August 27, the Common Council Fire Committee meets at 5:30 p.m., followed by the Police Committee meeting, which meets at 6:00 p.m. Presumably both those meetings will take place in the Council chamber at City Hall, since there is no indication that they will take place at another location. It seems after-parties are becoming de rigueur for Council meetings. Last week, Rebecca Wolff invited people to the Half Moon after the regular Common Council meeting and announced the after-party would be a recurring event. Tonight, SURJ (Showing Up for Racial Justice) is inviting people to gather at the Spotty Dog after the Police Committee meeting. 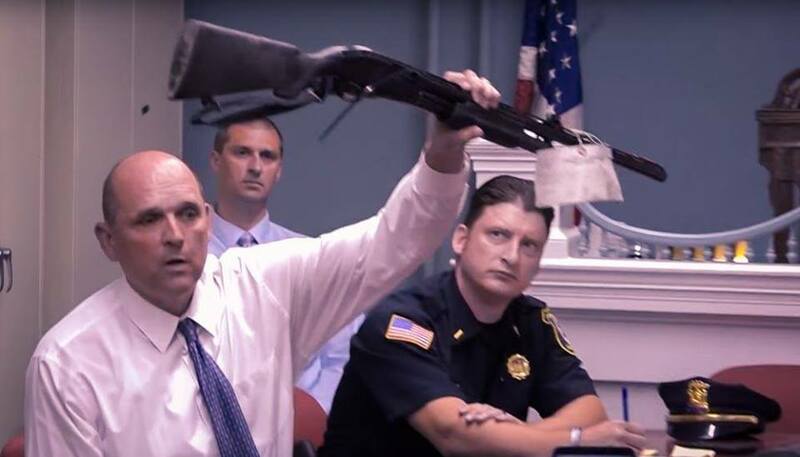 The invitation to the event on Facebook features the image above of Chief Ed Moore at the July Police Committee meeting, holding up a firearm that was confiscated by the HPD, and provides these details: "Show up to the Police Committee meeting. Share your views on recent happenings and policy ideas. Afterward, join SURJ, Councilmembers Kamal Johnson and Calvin Lewis, Council President Tom DePietro, and Supervisors Linda Mussmann and Michael Chameides at Spotty Dog for informal discussion and socializing." Tomorrow, Tuesday, August 28, the Hudson Development Corporation (HDC) meets at noon at 1 North Front Street. HDC is still in the process of selecting new members for its board. Gossips has learned that eleven people had expressed interest in serving on the HDC board. (The bylaws indicate the board can have a minimum of nine members and a maximum of fifteen; there are currently nine.) Four of the eleven are being recommended by the nominating committee to the full board, and two of those four people will be interviewed by the full board on Tuesday. At 5:30 p.m. on Tuesday, August 28, the Tourism Board meets at the FASNY Museum of Firefighting, 117 Harry Howard Avenue. At 7:30 p.m. on Tuesday, August 28, the Greenport Planning Board meets at Greenport Town Hall, 600 Town Hall Drive. There are two projects of interest to us Hudsonians before the Greenport Planning Board. The first is the proposal to construct a new retail center on Fairview Avenue and Healy Boulevard, which would have Aldi's as its anchor and McDonald's as its centerpiece. 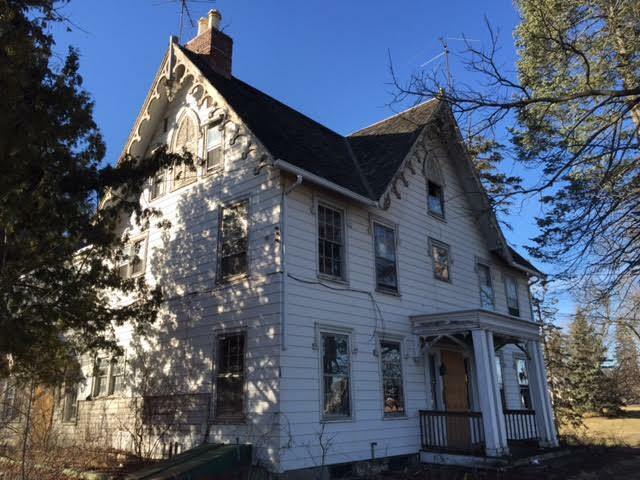 At the last Planning Board meeting, the developers were told that the Gothic Revival house known as "The Pines" had been deemed eligible for listing in the National Register of Historic Places, and they were asked to propose new plans that incorporated the building into the design rather than demolishing it. The agenda for Tuesday night's meeting indicates that the applicant "has deferred until the September meeting." The other project before the Greenport Planning Board that Gossips is following is the proposal by East Light Partners to site solar arrays on Route 9 and adjacent to the grounds of the Dr. Oliver Bronson House. That project will be coming before the Planning Board tomorrow night. The agenda notes: "New plans submitted. 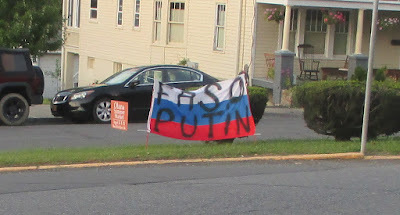 Email from National Grid, and letters from Olana and Scenic Hudson attached." This afternoon, Peter Spear published Part 2 of the series of videos he is calling "Pedestrian Observation." This time, Spear set up his camera at the crosswalk at City Hall Place and Warren Street. If you watch carefully, you'll see some familiar people making their way across Warren Street, not necessarily in the crosswalk. A little history of this crosswalk: Back in the day when I when was on the Common Council, the late Christina Malisoff, who worked at the Opera House, was a staunch advocate for a crosswalk at this point on Warren Street. A visitor to Hudson, after leaving the Opera House, had walked out into the street and been hit by a car. I tried to make the crosswalk happen, appealing to then chief of police, Ellis Richardson. 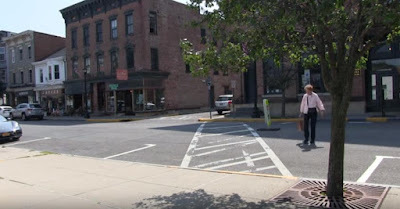 Richardson responded to my appeal on behalf of people trying to make their way across Warren Street by arguing that the progress of local drivers making their way up and down Warren Street would be impeded by having to stop at crosswalks. A couple of years later, I learned that the way to achieve the goal was simply to ask DPW superintendent Rob Perry to make it happen. 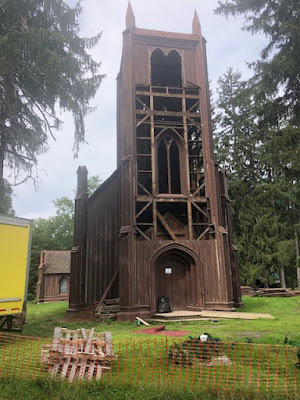 Last Wednesday, I did a post about the cemetery here in Hudson--the original Hudson City Cemetery and Cedar Park--and an initiative that could lead to the cemetery being listed in the National Register of Historic Places and maybe getting some volunteer TLC: "A Little Help from Our Friends." On Friday, a reader alerted me to a legal notice regarding another area cemetery, which appeared in the print version of the Register-Star. That notice appears below, with the list of the people named in the notice omitted. The notice inspired me to go out to Mt. 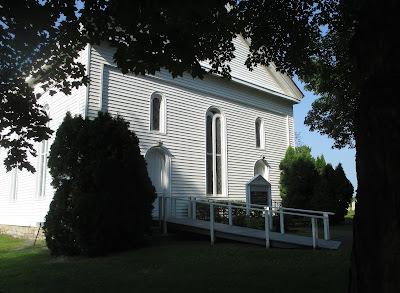 Pleasant Reformed Church and visit the graveyard. There I found several tombstones and monuments tied with yellow caution tape. The tape appeared to have been there for a few months, if not longer. Seeing the tombstones tied with caution tape reminded me of a story told to me years ago by a colleague in New York. While he and his wife and their two young children were exploring an old cemetery one weekend somewhere in New England, a tombstone toppled over onto his daughter. He rushed over and lifted the stone, freeing the little girl. After it had been determined that his daughter had suffered no injury, he went back to the cemetery and tried to repeat the feat of lifting the stone. He found he couldn't budge it. 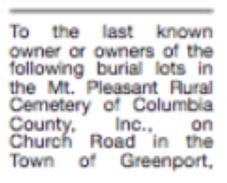 Certainly, tombstones in danger of toppling over present a liability risk, but, whether it's done by descendants or cemetery management, can tombstones and monuments marking people's graves really just be removed? It's possible that John L. Edwards Elementary School is bigger than those of us who go there for the occasional meeting in the "cafetorium" or to vote on the HCSD budget think it is, but how big is it really? 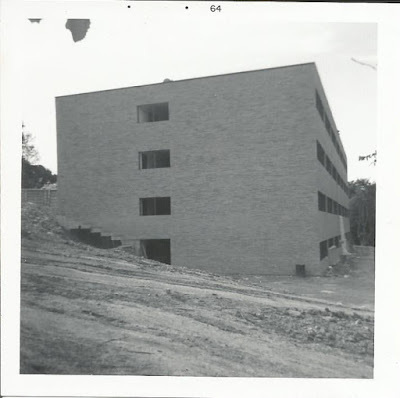 A post that appears on Fourth Ward supervisor Linda Mussmann's Facebook page suggests the mid-century grade school could accommodate the Youth Department, the Common Council chamber and all the offices now located in City Hall, the Hudson Daycare Center, the Code Enforcement office, the Department of Motor Vehicles, the County Clerk's office, the County Treasurer's office, the Board of Supervisors chamber and all the offices currently housed in 401 State Street, and the Probation Office and all the other offices currently housed in the old Sixth Street School. It could be true, but it staggers the imagination. 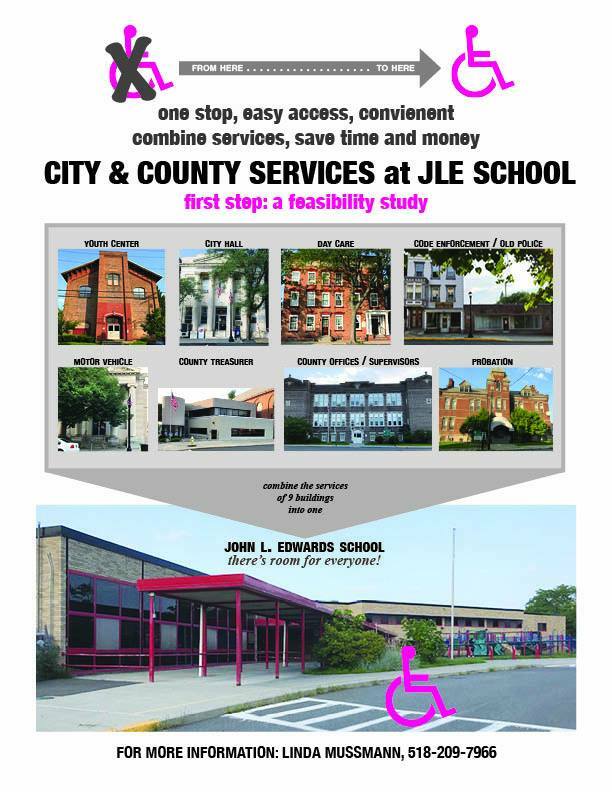 Let's hope that the feasibility study requested by the resolution passed by the Common Council on Tuesday provides a better sense of what the soon to be abandoned school building, for sale for upwards of $5 million, could realistically accommodate. 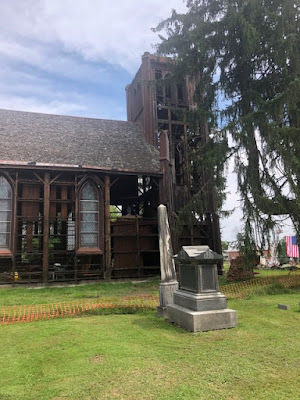 Earlier today, when writing the post about the Church of St. John the Evangelist in Stockport, I included information found in Wikipedia that the church was the first Episcopal church built in Columbia County. The inaccuracy of the statement was soon pointed out to me by a member of Christ Church in Hudson, who maintained, accurately, that the original Christ Church building, located at Second and State streets, had been built before the Episcopal church in Stockport. The first formation of a religious society by the Episcopalians in Hudson took place soon after the year 1790, but the precise date of their church organization cannot be given. About the commencement of 1795 the society began to move in the matter of providing for themselves a permanent house of worship, and to that end, in March of that year, their vestrymen, Dr. John Talman and Mr. John Powell, made a formal petition or request to the proprietors that a suitable lot of land should be granted to them on which to erect the proposed edifice. . . . The wardens made selection of a lot, but desiring afterwards to change it, were permitted to do so, and then decided on the lot on the southeast corner of Second and State streets, which was conveyed to them for the society, for the erection of a church building upon it, and for no other use. 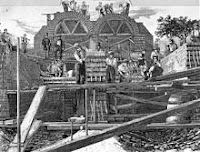 The house was commenced during 1795, but, on account of a lack of funds (mainly caused by the dishonesty of a fiduciary in whom the society had reposed perfect confidence), it was not completed until seven years passed. 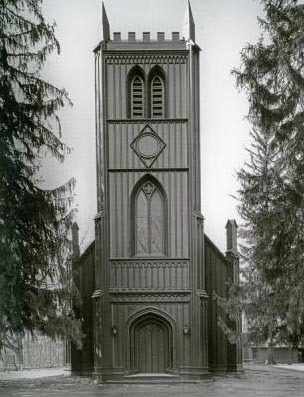 The lot had been granted on the condition that if a church should not be erected upon it within the space of five years it should revert to the proprietors, but those liberal-minded men had no thought of profiting by the church's adversity. The edifice was first occupied for the Christmas services of 1802. . . . 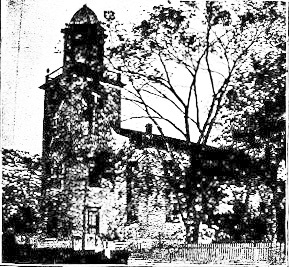 When Christ Church moved to its current building at Union and East Court streets in 1857, its original building was sold to the Wesleyan Methodists, who merged with the Zion Methodist Episcopal Church in 1860. Although the 1802 church building no longer stands, the site is still the location of A.M.E. Zion Church. Last December, the Register-Star reported that the Church of St. John the Evangelist on Chittenden Road in Stockport was to be dismantled and moved to an unknown location: "Historic church to be moved to new home." The parish of Saint John the Evangelist was incorporated in 1845 by the owners and workers of the textiles mills of Stockport. 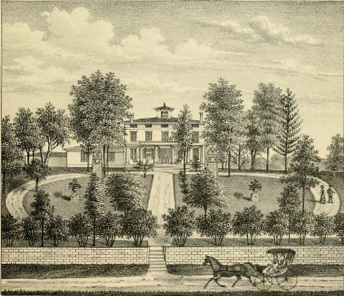 Joseph Marshall, a founder of the Hudson Print Works (the first cotton printing works in the state) was a church warden and, with two others, supervised the construction of this Gothic building. The architect is not known. The church closed its doors as a place of worship in 2014, and the building was sold in 2017. This morning, a reader sent me these pictures documenting the progress of the church's dismantling. Hudson, or more specifically Time & Space Limited and its founders, Linda Mussmann and Claudia Bruce, is the inspiration for a new movie starring Tyne Daly called A Bread Factory. Amanda Purcell has the story in today's Register-Star: "Film puts Hudson on the big screen." Since 2016, Peter Meyer, veteran journalist and founder of the not-for-profit School Life Media, has been working with students in the Hudson City School District to promote literacy, teach content, and develop skills by teaching the basics of journalism, from research to writing. Last spring, the program was featured in the New York Times: "Reader Idea: Promoting Literacy With Journalism Education and The New York Times." 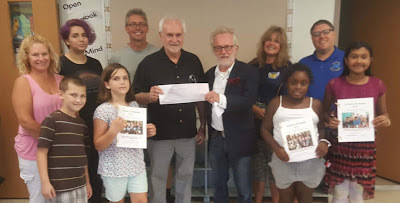 Recently, the Junior Journalism program received a $4,000 grant from the Raymond C. Kennedy Foundation, established by longtime publisher and owner of the Register-Star and the Chatham Courier. The picture below shows Tony Concra, a member of the board of the Kennedy Foundation, presenting a ceremonial check to Meyer. Also shown in the picture are, in front, four students in the Junior Journalism program and, at back, from left to right, Lori Below (HCSD teacher), Olivia Otty (SLM coordinator), Gordon Pratt (HCSD teacher), Joanne Ally (HCSD Afterschool Program assistant director), and Mark Brenneman (principal of Montgomery C. Smith Elementary School). Meyer commented, "We are not just grateful for this generous donation, but it is especially meaningful coming from an organization created by a beloved and successful local newspaper publisher."